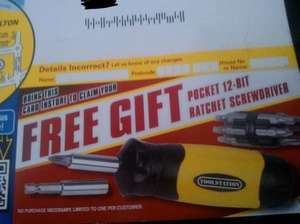 Got this mailing flyer through the post this morning if you got one check bottom right corner to claim a Free Pocket 12-Bit Ratchet Screwdriver no purchase necessary. You just go instore with the flyer to claim! One per Customer no purchase necessary! What is the point in this post? The only people it applies to are those with the flyer, and those with the flyer will already know about it, making this post obsolete. What is the point in this post? The only people it applies to are those … What is the point in this post? The only people it applies to are those with the flyer, and those with the flyer will already know about it, making this post obsolete.